I really love baked beans. Even the cheapest supermarket brand, on toast, is a treat for me. Even more of a treat since I moved to Paris, because Heinz Baked Beans sell for €2-€3 a tin here in France. Because we're chic, because we're in Paris, and not at all because it costs a quarter of the price of baked beans, here is a recipe for a white bean purée enriched with tomato, rosemary, and garlic. And it's almost as easy as opening a tin of baked beans. In a medium saucepan, heat all the ingredients excluding the olive oil (if using). Simmer uncovered for 10 minutes. Fold in the olive oil, although it's fine to leave it out if, like me, you get more than enough calories elsewhere. Blitz the contents of the pan with a hand-held/submersion blender, or in a blender if you really love washing up. Grind in some pepper, and taste to see if you want to add some salt. 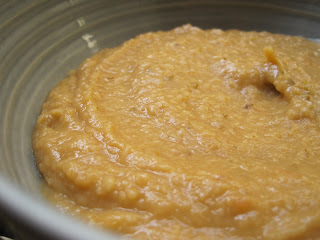 This super chic bean purée serves a great alternative to mash wherever you might be tempted to use mash. Doesn't work terribly well on toast; does work terribly well with a swanky puy lentil or braised vegetable dish.